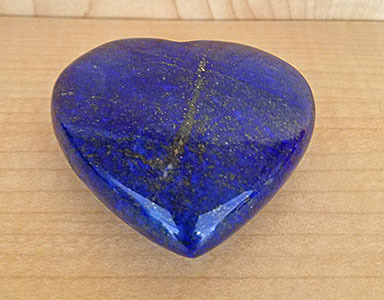 This deep blue, rich and royal AAA-graded Lapis Lazuli heart-shaped gem stone adorned by golden flecks of pyrite is deserving of finding a worthy owner. Fashioned into magical amulets since ancient Babylonian and Egyptian times, Lapis Lazuli was often shaped to resemble an eye by the Egyptians. This calls up the metaphysical properties of the crystal benefits of Lapis which are reportedly best utilized in the Third Eye chakra. The deep blue color ties it to the throat chakra as well, and can help balance subtle energies in the psychic and power centers of the auric field. 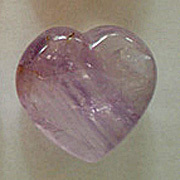 Looking at it, it is easy to recognize that it could easily be blessed and dedicated as a talisman that could tie one to a master such as Morya. Carried on one's person, or placed on the altar, it could serve as a gentle yet powerful focus and reminder to remain vigilant and attentive to discerning God's will in the moment.